"Find something related to love." Hey guys! My name is Syd, and next to me and on my coffee mug is my lil' stimker, Butch! Butch is a 4-year-old English Bulldog with a gorgeous underbite, six crooked teefies, and an affinity for extra sharp cheddar cheese sticks. In short, he's perfect. Since I'm keenly aware of Butchy's innate star power, I FINALLY decided it was time to make him an Instagram account — but not before asking some seasoned Insta veterans their advice. 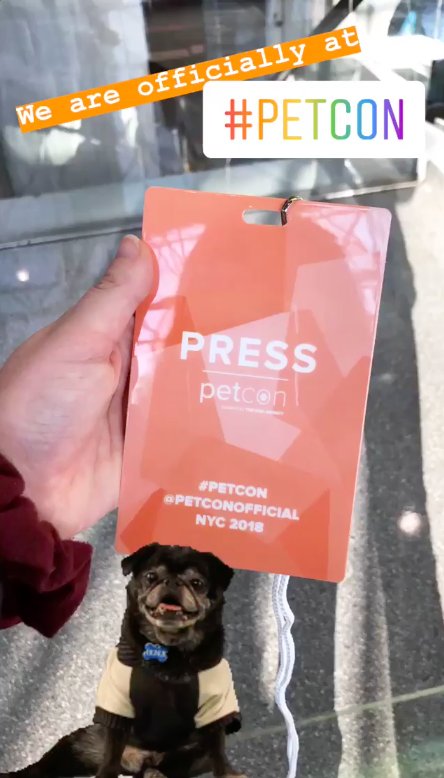 So I took to Petcon, a convention where Instagram-famous pets and their owners meet and mingle with other creators and fans, to learn how to create the best content for Butchy's page. "Since Bart's a little grumpy guy, we like to play up his grumpiness," his hooman told me. Butchy thinks you're tacky and he hates you. "High-quality pictures and posting regularly will build an audience," Klaus's hooman, Nick, says. "It takes a little bit of time, so just have fun doing it!" I have to confess that posting consistently on sosh meds (social media) isn't one of my strong suits. Buuuuuuut I'm happy to report that after starting Butchy's account six days ago, I've posted TEN TIMES!!!!! And in those six days, Butchy's gained over 100 followers, with about 10+ new accounts following per day!!! I'm hoping that if I keep up with it, Butchy will have a pretty steady fanbase in several months! For a special moment to share, I asked my mom to send me this pic she took of me lovin' on Butch one morning. This post got some engagement, including my little sister telling me to screw myself for correctly acknowledging that I am Butchy's favorite. As for how to build your audience, Hot Dudes with Dogs founder Kaylin Pound says: "Engage with as many accounts as possible!!!" I did notice that the more I engaged, the more ~loyalty~ our followers showed. I'm talking consistent likes, comments, and even sharing Butchy's page with other people! "People can tell when you're not being genuine, so don't try to force anything!" advises Bertram's mom! For some low-hanging, *UNFORCED* content, I posted this quick lil' vid my mom sent me of Butchy doin' some mlems. It's simple, unprompted, and just what the people want!!!!!! "Training your pets to sit still miiiiight be the most important thing!!!" says Jocelyn, Leonardo and Annabelle's mom. "Running the account is something I do with my kids," Melissa Cristifano, mother of three kids and15 FUR BABIES (!!!!!!) says. "We have so much fun doing it together, and I think that comes through in our posts!" While this isn't the best quality picture of Butch, I love it because we had so much fun on the morning it was taken! Butchy, my mom, and I went on a beach walk, and in his typical fashion, Butch was being lazy and would only move if we baited him with a cheese stick. For something love-related, I took this picture of Butchy snugglin' with his stimkies (aka his stuffed animals.) When he's not tearing them up and ripping their stuffing out, he puts his paw over them like this. He's a bit of a fickle lover. Pls note his teeny tiny teefies. Overall, I'd say each of the influencers' advice really helped! Keeping their points in mind, Butchy and I will continue to bring you prime Bulldog Content™ as consistently as possible!!!!!! What advice do YOU have for running a pet's Instagram? Please let us know in the comments!! !